Your luxury boot camp is waiting….. join us for the Ultimate Luxury Boot Camp in Marbella! On the Mediterranean Sea, with wall to wall sunshine, our Marbella Boot Camp is the ultimate luxury health retreat you've been searching for. Our fitness activities are fun and varied and designed to provide exceptional results. Our world class instructors will provide their usual dose of motivating high energy, inspiration, and humour to ensure you have a fun, challenging and rewarding mix during your stay. We run a programme of daily workouts and activities that will take place around the villas and local area or at the stunning beaches nearby. Those joining us for weight loss, we recommended trying to participate in every session every day. Those looking for a mixture, or who also want to de-stress & relax with more holiday time, are free to join as many or as little of the sessions as you wish... bear in mind the more you do, the better the results! Just one week spent with us, will see you well on the way to a healthier, happier, lighter life. The food is equally as important as the training, therefore delicious tasty healthy meals and snacks are a central part of the experience! We are really excited to have guest chef Jamie Raftery, The Holistic Chef, joining the team. Jamie is a revolutionary visionary and Michelin level trained chef with 18 years cooking experience. He has worked at the sides of the best chefs in the world, perfecting his craft under the mentorship and guidance of Gordon Ramsey, Michael Caines, Thomas Keller, Corey Lee, Rasmus Kofoed, and Heston Blumenthal. Together we have designed a delicious menu that nourishes your body, mind and soul. Using the freshest locally sourced ingredients all the meals and snacks will exclude wheat, gluten, additives or chemicals, to help the body detox, reduce inflammation, and aid weight loss. Meals will include complex, unrefined carbohydrates for energy, and foods rich in protein to help repair muscles along with healthy fats. The menu will also incorporate a wide variety of seasonal fruit and vegetables to ensure we are eating from the rainbow and is so nutritionally dense that you won’t feel hungry. Jamie will also be hosting a cookery workshop and Q & A so you too can learn how to make some healthy treats and put some of the meals into practice. For those who are looking to do a cleansing detox for nourishment and healing we also offer a juicing programme. A juice detox has incredible healing powers as well as health and beauty benefits. 7 days of juices and vegetable soups will hydrate the body with concentrated beneficial, energizing, and healing nutrients that repair, rebuild and regenerate. It clears the body of toxins and gives natural weight loss with exceptional results. Other benefits are clearer skin, your hair shines, your eyes brighten, mental clarity and vision are improved, and you will feel more energetic. Places on this course are available to men and women and we have a range of rooms to suit from shared group options to more luxurious deluxe rooms with private balcony. If you're interested in a UK based residential 7-night boot camp please also check out our Wales boot camp and Devon boot camp. If you want a glimpse of what happens at our boot camp have a look at our gallery. No other fitness or weight loss bootcamp gets the physical and psychological transformations that we can help you achieve. Our results speak for themselves as do happy clients, so be sure to check out their testimonials. 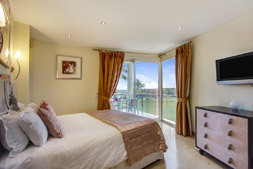 With space for up to 18 guests, our luxurious villa boasts 10 large bedrooms. 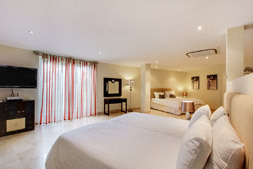 Each bedroom has an individual design with Egyptian cotton sheets. Most bedrooms have their own balconies and one has access to a private roof top Jacuzzi. For your relaxation this luxury villa in Marbella features 2 heated swimming pools, indoor and outdoor, and 3 Jacuzzis, to choose from as well as a pool table and games room. The villa has breath taking views of the Mediterranean and African coast, with the nearby stunning beaches just a 15-minute walk away. These are just some of the features which provides the ultimate in luxury at our incredible health retreat in Spain. 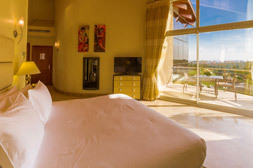 Surrounded by natural beauty, the outdoor terraces invite you to soak up the sun, gazing out towards Gibraltar and Morocco, past the ocean, mountains, and the neighbouring golf course. Group transfers to and from Malaga airport within our designated arrival times are included in your stay. A transfer time will be allocated and emailed to you prior to your arrival once your flight details have been confirmed. Transfers arriving outside these times will be subject to additional charges. Please DO NOT book your transfers to arrive at the accommodation before 5pm or any later than 9pm. Check out from villas on departure day is no later than 10am. The Spain boot camp is located in a luxury villas in Los Flamingos golf course and a short distance to Puerto Banús and Marbella and the beaches of San Pedro. Malaga Airport is approx 60 mins from our Spain bootcamp. You can fly from any international airport that fly direct to Malaga airport. We recommend using www.skyscanner.net to search for flights. Skyscanner.net search all airlines from all airports. Usually if booked in advance you can pick up flights from £100-£200 return. This is a lot cheaper than people think and cheaper in some cases than a return train journey say from Manchester to London. Massages & Beaity treatments are available in the evenings at extra charge payable in cash. Do I need to bring any local currency? Yes if you require massage or beauty treatments or taxi fares for own transfers. Yes. This is like any other holiday and is highly recommended you have insurance in place to cover for injury, illness or cancellation. E111 European Health Insurance Cards are also required for UK Travellers wishing to obtain State funded medical treatment abroad.